Starring: O’Shea Jackson Jr., Corey Hawkins, Jason Mitchell, Neil Brown Jr., Aldis Hodge, Paul Giamatti, and more. In my opinion, music is only made for one of two reasons. 1. It is made to appeal to whatever fan base the artist/s are targeting and aim to get as famous as possible no matter the lyrics, sounds, or meaning in their songs or 2. the music that is made truly means something. N.W.A. was the iconic group that did number 2. Some would say N.W.A. are the fathers of west coast hip-hop. Some would say without N.W.A. hip-hop would not have some of the iconic rappers we have had over the years. Some would say N.W.A. was nothing but aggressive and useless and even some said that their music had no place in the entertainment industry, but if one thing is absolutely true, N.W.A. is one of the most iconic musical groups to ever present music to the world. Consisting of its most notable members, Ice Cube, Dr. Dre, Eazy-E, Dj Yella, and MC Ren, these men would change the face of hip-hop music and some would even continue to impact the music and entertainment world to this day. Now on August 14th, 2015, the feature film Straight Outta Compton has been released following the story of the icons themselves. 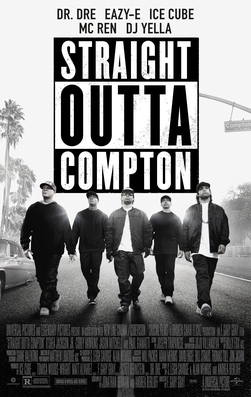 The film Straight Outta Compton follows the whole story of the west coast hip-hop group N.W.A. that consisted of O’Shea “Ice Cube” Jackson (O’Shea Jackson Jr.), Andre “Dr. Dre” Young (Corey Hawkins), Eric “Eazy-E” Wright (Jason Mitchell), Lorenzo “MC Ren” Patterson (Aldis Hodge), and Antoine “Dj Yella” Carraby (Neil Brown Jr.). Throughout the course of the film we witness the creation in both forms of the group itself and the game changing music they made. We witness the high rise to fame that they achieved and the ultimate fall they suffered through personal relationship fallouts and combating personalities. Aside from the groups focus within the film, we as the audience also witness the rise of some of the most renown artists that have been changing the music game for centuries like Dr. Dre and Ice Cube. Straight Outta Compton is a powerful movie in my opinion. N.W.A represented life as it happened in Compton but not only there, what is happening in life all over a nation. They represented the people who did not have a voice during the time of their come up. This film showed every important aspect as to why N.W.A. existed and how much talent these men really had/have. It was great to see the early stages of some of the most notable songs and sounds in hip-hop that is commonplace in many households. For N.W.A. it was more than just making music and getting popular. It was about putting music out that had purpose, their music meant something, meant something for someone. Gave mistreated individuals a voice. Whether you agree or disagree, that is obviously your choice but I can at least tell you; You will be the minority in this case. Contribution made by Jalen M.